Before the calendar change in the year 1660, Hogmanay was celebrated on the 11th of January. It is known as Old Yule Night. However in 1752 the old style calendar was dropped in favour of the Continental calendar by the then British Government. People were forced to loose 11 days in September of that year to bring Britain into line with Europe. This then made New Years Day the 1st of January. People of Britain were most annoyed at loosing eleven days and many still followed the old calendar and continued to celebrate New Year on the 11th. The North East of Scotland has always been a fishing region and fishermen and fisher folk are a superstitious lot and this ceremony is one of their fishing superstitions. They do this burning of the Clavie ceremony to ensure a successful fishing for the new year. Each year the villagers of Burghead, just outside Elgin, celebrate the traditional Hogmanay date by burning the clavie. From 6pm - 7.30pm eleven people (The Clavie King and his 10 men) take turns to carry the clavie through the streets, stopping at houses to present a smouldering ember. The procession continues to Doorie Hill on the ramparts of the ancient Pictish Fort where it is put down onto a stone altar and the hillside set alight so that people from the crowd can come and get a flaming ember to kindle a new fire at home to bring good luck for the New Year. The eleven men are traditionally fishermen from the village. Each of the Clavie men are descendants of village folk who have taken part in the ceremony over the years. The clavie would traditionally have been a herring barrel but these days it is an iron hooped whisky barrel daubed with creosote. This is filled with wood shavings and tar and then nailed to a carrying post. The same nail is used each year. It is considered a bad omen for the village and the fishing industry if the Clavie is dropped. In the olden days one man, the strongest in the village, would carry the burning Clavie. It was quite dangerous because of the burning tar that could trickle down onto the back of the carrier. The Clavie would also be carried around the boats in the harbour for good luck, but this tradition is no longer performed. Take the A96 to Elgin then turn off at the B9013 to Burghead. Read about the Hogmanay Stonehaven Fireball Ceremony. More Scottish customs and traditions. Aboutaberdeen readers may be interested in a DVD called In Search of Ancient Britain by Kenneth Erik Moffatt. It includes footage and information about the Burning of the Clavie at Burghead and also includes 5 fascinating documentaries exploring living survivals and customs of Britain's indigenous cultural heritage. 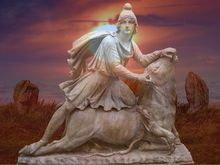 In Search of Ancient Britain has been edited from Kens ever growing Film and Photo Archive, the main feature explores the forgotten Sun God Mithras, and his impact on the Western World. The DVD also includes documentaries on The Abbots Bromley Horn Dance, The Allendale Tar Barrels and Melrose's Masons Walk.